My stylized version was inspired by the traditional Spiral Goddess symbol of a woman's figure with her arms circling her head. This symbolized life, and the cycle of life-death-rebirth.I formed heavy copper wire into the shape, then hammered the wire flat, adding texture. A clear Quartz point was wire wrapped in the legs (Quartz is associated with all 7 chakras, and is an amplifier of other crystal's healing properties), and seven Chakra crystals were wrapped inside the circle of the arms. A simple hammered hook bail holds my Goddess and hangs from an 18" town leather necklace. The Chakra crystals are Ruby, Orange Topaz. Citrine, Emerald, Aquamarine, Sapphire and Amethyst. 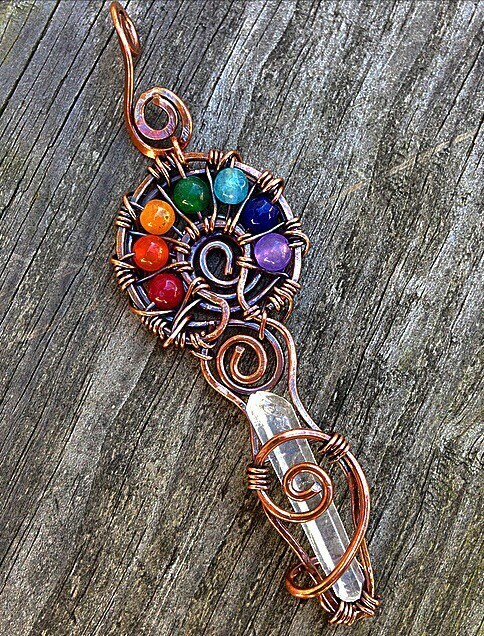 Each represents a Chakra color, and all have healing properties. This item ships free to the United States. Girlfriend loved it for Valentine's day. Seller was very very nice and made sure everything was taken care of. She made my first Etsy purchase very smooth and easy. My Girlfriend also loved the added gift that was very thoughtful thank you! A pleasure to do business with always. Beautiful craftsmanship and energy. A - plus service with a smile and top quality work to match!!! Custom assorted wholesale packages are available, message me with your requirements and price point desired. Do not wear while swimming, showering or in hot tubs. Clean & polish with a soft cloth, such as cotton flannel, or a jewelry cleaning cloth. Do not use soaps, cleaning solvents, brushes or abrasives as they may damage your jewelry. Copper cleaning- if your item is bare copper, it will naturally deepen with patina as it ages. If you prefer a bright, shiny finish you can clean it with vinegar and a soft bristle tooth brush, gently! Please note that some pieces are made with coated copper wire, which will not tarnish or develope patina, or have been sealed with a special acrylic to slow down oxidation. Details are ways included in each listing. If you are not sure how to clean any item, contact me.